Ground Water level of Kanyakumari considered to be safe : What about other Districts ? A study of ground water level in the state has presented a bleak picture. The assessment by the State Ground and Surface Water Resources Data Centre in 2009,the latest to be undertaken,has identified 138 panchayat unions, constituting 36% of the total panchayat unions in Tamil Nadu, as over-exploited,where extraction of ground water is more than recharge.The worst hit districts include Vellore,Madurai,Coimbatore,Trichy,Thanjavur,Salem,Tiruvannamalai,Namakkal,Perambalur and Dindigul. 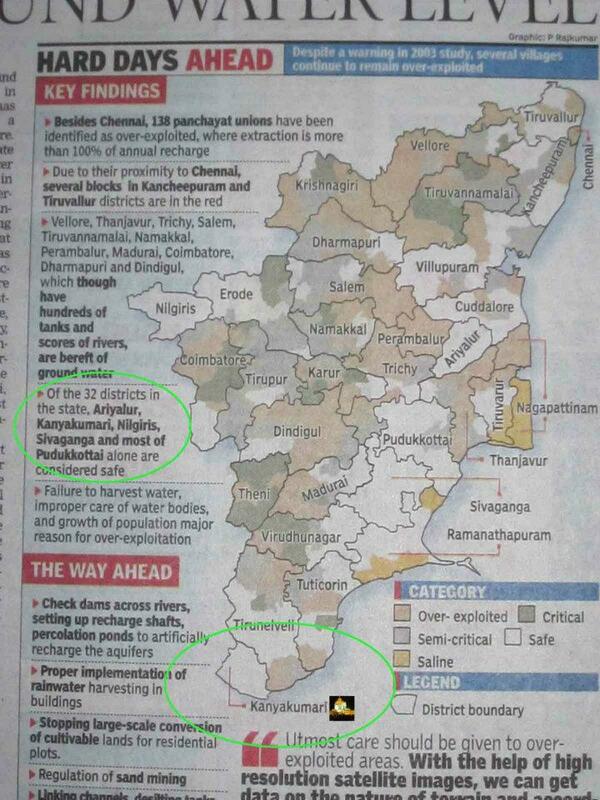 The situation in Kanyakumari, Nilgiris,Sivaganga and most parts of Pudukkottai is considered to be safe. Surface water is almost harnessed, the ground water level has become all the more critical. Unless environmental policies are adhered to and water harvesting facilities are put in place,the state will lose all its ground water resources in a decade, said K Santhanam, senior scientist at Sathyabhama Universitys Centre for Water Research.The disturbing trend is that several panchayat unions continue to remain over-exploited,though the first warning came in a similar assessment in 2003.At least 14 panchayats in Vellore,10 in Salem and Thanjavur,nine in Trichy and seven in Villupuram face crisis. Failure to harvest water,improper care of water bodies and exponential growth of industries and population resulted in several panchayat unions moving from safe to over-exploited and semi-critical to critical state with regard to ground water levels.In Tiruvallur,ground water is overexploited to meet the needs of the neighbouring Chennai.The ground water in some panchayat unions in the coastal district of Ramanathapuram,which was once considered safe,has now been assessed as poor quality because of sea water incursions and over-exploitation.The rivers are polluted and have become carriers of sewerage.I do not know how we are going to restore them, said Prof S Janakarajan of Madras Institute of Development Studies. Geologists advise construction of check dams across rivers,sub-surface dykes (built under water),recharge shafts,percolation ponds and sustained efforts to harvest rainwater in buildings besides restraining large-scale conversion of cultivable lands into residential plots.Utmost care should be given to over-exploited areas.With the help of highresolution satellite images,we can get data on the nature of terrain and accordingly provide water storage facilities, said hydro-geologist Dr S Thillaigovindarajan of Institute of Remote Sensing,Anna University.The state government has now decided to launch an elaborate biennial assessment of the ground water level from this year onwards.